Charlie the terrapin was found at Skegness boating lake. A terrapin which faced almost certain death in cold UK waters has been rescued from Skegness boating lake. The Yellow Bellied Slider Terrapin, which hails from southern US states like Florida, was found by a member of the public after being abandoned in the lake. The teraapin has been rehomed at The Ark wildlife park in Stickney. 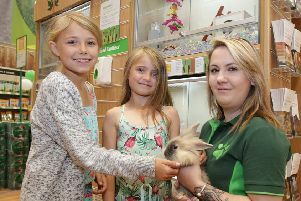 They took the creature to nearby Skegness Aquarium which, in turn, contacted The Ark Wildlife and Exotic Animal Sanctuary in Stickney. The Ark has a heated pool and tropical house dedicated to unwanted terrapins. Jamie Mintram, Ark owner and resident reptile expert, was delighted to go and collect the terrapin who has now been named ‘Charlie’ by her new keepers. Charlie is settling in and feeding well in her new home and is pool buddy with another three Yellow Bellied Sliders, who were also found wandering around by the boating pond in Skegness back in 2016. “The average lifespan of a yellow-bellied slider is over 30 years in the wild and over 40 years in captivity,” said Jamie.